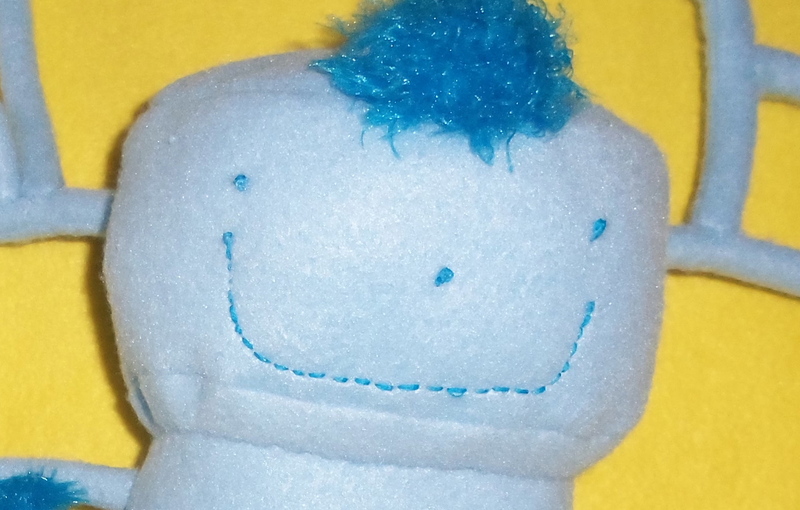 A: We take pictures that your child has drawn and turn them into soft cuddly toys for them to love. Q: What does that cost? A: Our cuddly toys generally cost between $80 and $130 US depending on the complexity of the drawing. There is also a $15 shipping cost in North America. Other international shipping costs will be determined as needed. Q: How long does an order take? A: That will vary completely depending on the number of orders currently waiting to be filled. When you contact us to request a Cuddly, we will give you a ball-park figure for a time-frame. A: See the “How to Order” section on the website, in the black bar under the “My Own Cuddly” logo. Q: Will you make corrections on my child’s drawing? A: We believe that a child’s art is a sacred thing. As such, we will make all attempts to copy it as closely as possible. We will not “fix” it, as we believe it is perfect as is. So if your child’s character has 6 fingers, so will his Cuddly. Q: How big is a Cuddly? A: That will vary, but usually will range from 12 to 15 inches wide or tall. Of course, we can accommodate orders for a larger or smaller cuddly, based on the customer’s request. Q: Will you copy well-known characters? A: We will NOT make a Cuddly of a copyrighted character. No, not even your child’s version of that copyrighted character. If you actually own the copyright to that character, we may consider it. Q: How old does my child need to be? A: The artist should probably be at least 3, unless your two-year-old is remarkably good at drawing. Teens would probably make drawings that would be too detailed for us. Q: How do I clean my Cuddly? A: Materials will vary widely. Some of them may be machine washable, while others may have fabrics that could shrink or bleed. To be safe, wiping with a damp cloth would be good. Use your own common sense. Q: Will my Cuddly be safe for my child to play with? A: All care will be taken to make your Cuddly safe. We will not use plastic eyes or buttons that might be pulled off and swallowed or choked on by small children. But of course, as always, parental supervision and judgement are the best safety policy. Hey! Looks great – great work!! I was wondering if you offer gift certificates? Sure, we can do a gift certificate. Yes, shipping to Canada is $20 US. What a wonderful idea! I love your work! Thanks for making me smile. I would like to know if you would ship to Brazil and what would be the cost of it. Yes, we ship worldwide. Shipping to Brazil would cost $50 US, and would take at least 2 weeks shipping time. Great work! Are you willing to work with children’s book authors? I have a series that I am doing and looking for someone to create the softie for..
Hi! would you do/recreate a stuff monkey that I lost during my travel? We can’t reproduce copyrighted characters, so if your monkey was a hand-made item, we could reproduce it. But if it was a store-bought character, we can’t. Hi there what’s your current lead time and shipping costs to Northern Ireland!?! Hi! Thanks for your interest in My Own Cuddly. Right now, we are a 4-5 week waiting list. Shipping to Europe can range from 10-20 days, usually, but can be unpredictable.